Bilal Lashari’s Waar is the most anticipated and hyped Pakistani film, which was also a hit at the local box office, is the highest rated feature film of 2013, according to Internet movie database. The movie was given a rating of 9.1 out of 10 in a polling based on more than 10,000 users rating, ranking above films like The Wolf of Wall Street and Gravity. It is worth mentioning here that Indian film Bhaag Milkha Bhaag reached at a position of number eight. Bilal Lashari, the director of the film excitedly expressed his emotions that it was not just a reaction to a film, but a show of immense love and support from proud fellow Pakistanis and a new beginning for our national cinema. Waar was released on 42 screens in all over Pakistan and set a new record of box office collection pertaining to Eid openings after a first day opening of Rs. 11.4 million the big budget flick earned a total of Rs. 42.6 million within a week breaking all previous records of Eid collections. The story of Waar revolves around Major Mujhtaba (Played by Shan), a retired army officer who has taken pre-mature release from the Army because of his own personal reasons. The theme of the film involves a counter-terrorism operation being conducted in the Northwestern tribal region of Pakistan, headd by Ehtesham (played by Hamza Ali Abbasi) and coordinated by an intelligence officer played by Ayesha. A major terrorist attack was revealed through intelligence resources so Ehtesham and the intelligence officer planned to assist Major Mujtaba who is determined to counter the preemptive. On the other hand, the RAW agents Ramal (Shamoon Abbasi) and Laxmi (Meesha Shafi) are the primary cause of most trouble in Pakistan. As per unfolding of the film, they are behind political murders, suicide bombings and even kidnapping. There is another RAW agent who works as a social worker by day and honey-traps willing politicians by nights. Accordingly a special task force of the police is trying to tackle terrorism in the tribal areas but there comes a time when they realize that country is about to be hit by a terrorist attack and none but the retired Major Ehtesham can lead such a complicated operation. The theatrical trailer of Waar was launched in January 2012, followed with detail in January 2013. Announcement of the release of the film kept on changing one after the other, initially it was scheduled to release on 6 September 2013. The film was distributed by ARY Films and Mandviwalla Entertainment, earlier it was reported that the film would be distributed by Warner Bros. The film is reported to be released in twenty five countries and is all set to be released in the UK . including India. Waar released on UAE cinemas on December 12, where the movie actors graced the red carpet at the Grand Cinema, Wafi City. Waar released in cinemas across UK on January 17, 2014. 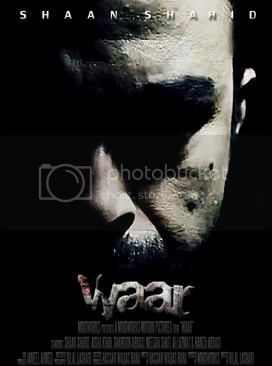 Waar is an artificial projection of real time happening of war on terror in Pakistan. The film’s title “Waar” means Strike, attack in Urdu language. Film is primarily an English language film with some dialogues in Urdu. According to the producer Hassan Waqas Rana they considered dubbing the movie in Urdu but dropped the idea as it compromised the lead role played by Shan. The sequence of the film has almost four hundred visual effects, therefore, it took three years to complete. Initially, Tom Delmar who has worked as stunt director in a number of Hollywood movies was earmarked as direct the film, later Lashari was chosen as the director who was already working with Rana on another project. Waar is Bilal Lashari’s debut as a director, who earlier has directed music videos and assisted Shoaib Mansoor in Khuda Kay Liye. Ali Azmat and Meesha Shafi both of whom are known for singing are making their acting debut in the film. Originally Ali Azmat‘s and Ayesha Khan’s roles were limited to guest appearance that were later expanded to full roles. Hamza Ali Abbasi who joined the film crew as assistant director on the film was casted as an actor. Filming of Waar was completed at Lahore, Islamabad, Swat Valley, some scenes were also reportedly shot in Istanbul. The film is produced by Mind Works Media. Earlier it was reported that the film was shot in collaboration with the Inter-Services Public Relations (ISPR), the media wing of Pakistan Army but the director Bilal Lashari denied any such collaboration saying that the confusion might have arisen as Mind Works Media worked on a documentary film The Glorious Resolve along with ISPR at the same time when Waar was being filmed. The film is reported to be the highest budgeted film of Pakistani film industry with a budget of about Rs. 170 million. Waar opened on the first day of Eid al-Adha on 42 screens, the widest release ever, across Pakistan with 100% occupancy and it broke records with capacity audiences. It earned ₨1.14 crore in its first day breaking the previous records.